I think it's well established that I love to eat. Breakfast, lunch, dinner, snacks... I'm no respecter of times. And when I am on vacation, good food is very important! That being said, I have decided to do a series involving my favorite eateries around the "World". Because there are so many, and in order to keep these posts manageable to read, I'll focus on a specific type of dining in a park/resort. For me, the Magic Kingdom really epitomizes the Disney experience. As such, our journey begins here. When it comes to a Quick Service meals in the Magic Kingdom, the first that comes to mind is the ever-elusive Be Our Guest. This restaurant is an anomaly in that it changes over from a Quick Service by day to a Table Service by night. I love this! First of all, the ambience is second to none. 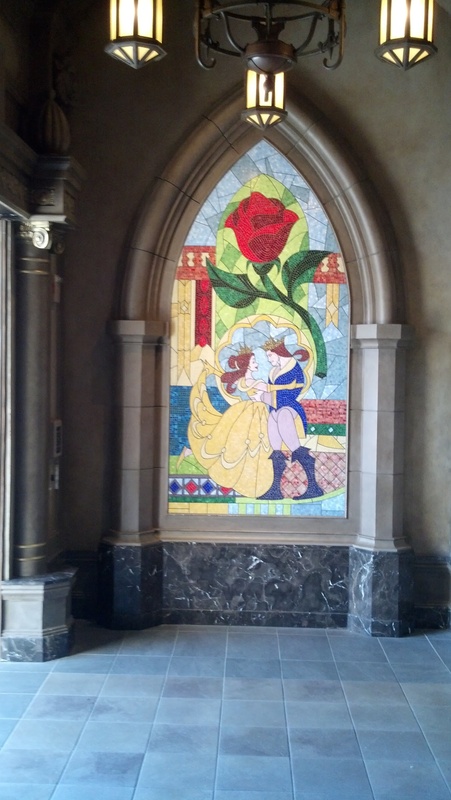 As a little girl who grew up loving Belle and her movie, dining in Beast's Castle truly never ceases to amaze me. Trust me, these pictures do NOT do this place justice! But really, the focus of this article is the food. And Oh. Em. Gee. It is fantastic! I typically get the carved turkey sandwich with pommes frites (AKA french fries), which is so so good! Dessert varies, but I love anything with the gray stuff on it -- and hubby almost always opts for the Strawberry Shortcake cupcake. Of course, there are tons of options here, and I'm pleased to say that they are a lot different from traditional fast food. Aside from the menu, this location is unique as far as how it serves your food. When you check in/order, you are given a small "rose". This is actually a handy little device that uses RDFI technology to allow the servers to know where you chose to sit - and they deliver your order right to you! You also get real silverware (as opposed to plastic). As far as seating choices go, I love dining in the West Wing -- it's so spooky and amazing. The trick with this restaurant is that you usually can't just walk in. Reservations are a must if you really want to dine here. So, when you need a "walk in" location, one of our favorites is Columbia Harbour House in Liberty Square. There are so many things I love about this place. But first, I have to give a shout out to my favorite greeter. He sings to the passers-by, rings a bell, and welcomes everyone in with a smile. He is basically a fixture from what I can tell - I think I see him every trip! The menu is definitely heavy on seafood, which happens to be my favorite. I love the fried fish and chicken basket when I feel like throwing my diet to the wind, but on my most recent trip, I discovered how amazing the salmon platter was! The decor inside is nautical, and there are some nods to the Haunted Mansion ... one of my favorite attractions! If you dine here, try to sit on the second floor - there is a great view! My 3rd go to in the Magic Kingdom is definitely Pecos Bill's Tall Tale Inn. This has been an annual favorite of mine, partially because of the fixin's bar! Now a disclaimer: there was just an announcement that this restaurant is slated to receive a new menu. And I am SUPER excited about it! Originally I was in love with their taco salad, which was discontinued a couple of years ago. Now, it is going to be a lot of burritos, rice bowls, and fajitas. Second to seafood, these are my favorite food groups! Now for some stunning news -- I apparently have absolutely no food pics from this establishment. This is likely because I'm starving and gobble down my food before taking a picture when I go here... I promise to rectify this situation on my trip in January! Hopefully the new menu will be in place by then so I can offer our loyal readers a review. So, those are my 3 faves in the Magic Kingdom. Honorable mention goes to the Diamond Horseshoe, which is only open seasonally. So, what are your go-to Quick Service eateries in the Magic Kingdom? Comment below!